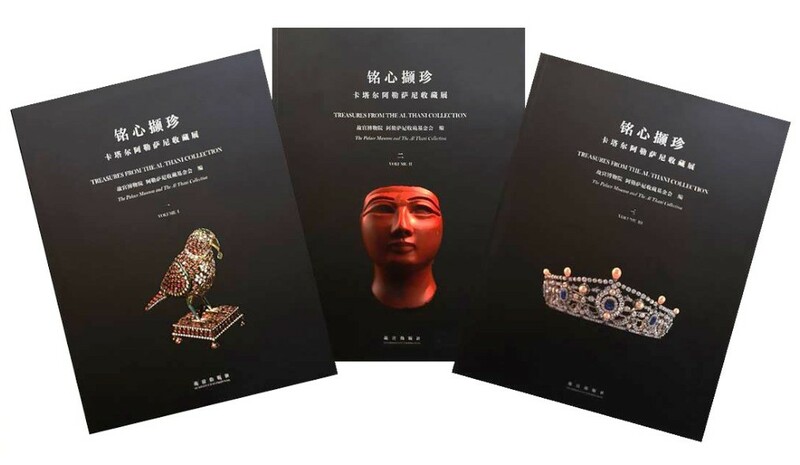 This three-volume set covers two exhibitions held in the Meridian Hall Galleries of the Forbidden City in Beijing in 2018. The exhibitions are a monumental survey of pieces from the Al Thani Collection together with very prestigious loans from the al-Sabah and Ortiz collections and the Fabergé Museum. The first volume of the set documents the exhibition “The Gems and Jewels of India”. It is split into different sections including: The Mughal Treasury; Dynastic Gem and Jewels; Objects of Jade and Rock Crystal; Objects in Gold and Enamel; Regalia and Jewelled Ornaments; Cartier and the Great European Jewellers, and, finally, Contemporary Creations. 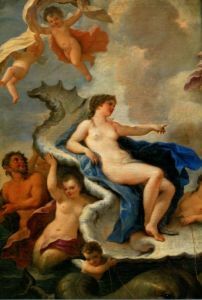 The second and third volumes both document a second exhibition, held in 2018, entitled “Masterpieces from a Royal Collection”. Volume II focuses on ‘The Ancient World’ and ‘The Wider World’. The former includes Egyptian, Greek and Roman, Mesopotamian and Iranian works as well as Central Asian treasures, whilst the latter has objects from China, Pre- Columbian Central and South America, Africa and the Pacific. Volume III is split more specifically into ‘The Islamic World’ and ‘The European World’. Each theme is further devided into sub sections which cover all aspects of art including Manuscripts, Miniatures, Metalwork and Textiles, or Medieval Reliquaries, Limoges Enamels, Renaissance Jewellery, Rock Crystal and Wunderkammer objects, Silver, Jewellery (Cartier, Melerio, Chaumet, Bolin) and 54 pieces by Fabergé. Text in English and Chinese. This new publication traces the history of the Lansdowne House marbles, from 1762 through to their auction in 1930, and its aftermath. Joseph Brummer, William Randolph Hirst and Spink’s were major buyers at Christie’s in 1930. The provenance of the Lansdowne pieces was remarkable; there were even pieces from Hadrian’s Villa. Gavin Hamilton and Thomas Jenkins were major suppliers. 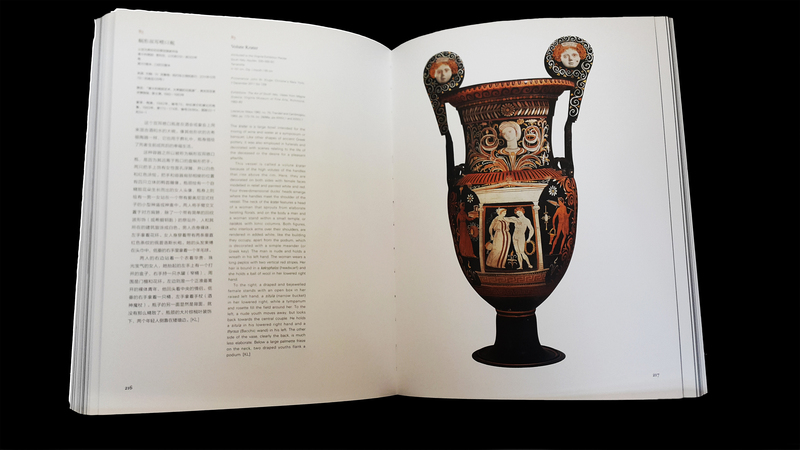 In two volumes, Angelicoussis reconstructs the collection. The first examines contemporary correspondence, provenance and plans for the sculpture galleries, and how they changed and developed. 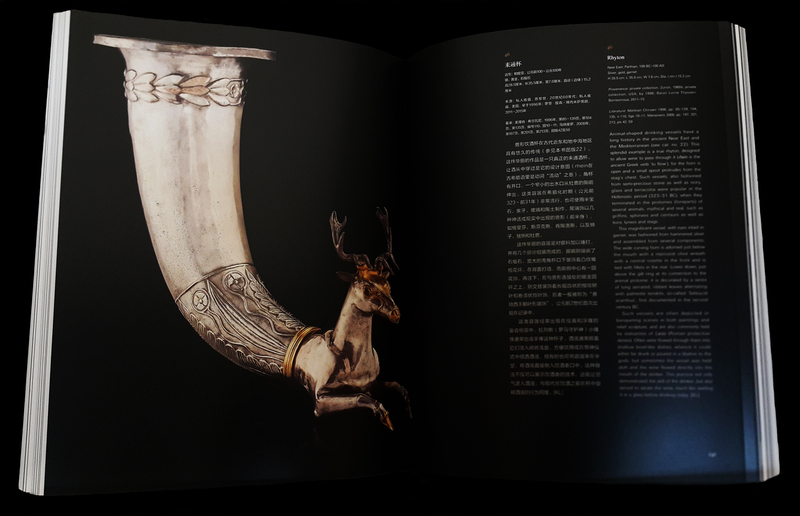 The second volume is a catalogue of all 117 pieces, documented with photographs and detailed descriptions. This catalogue is the first since Michaelis in 1792. 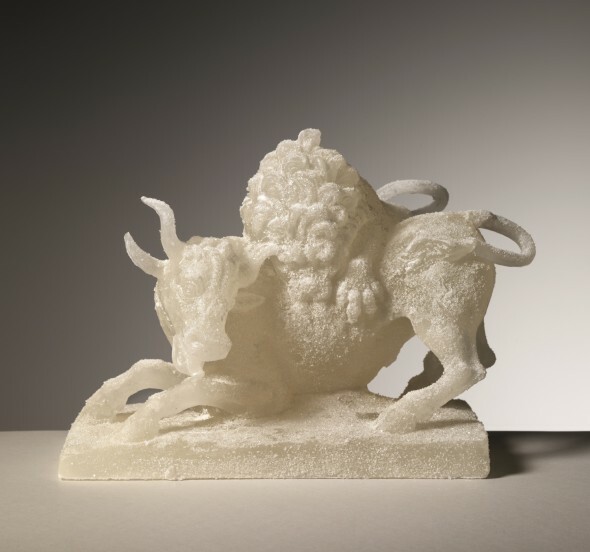 Angelicoussis previously published the sculptures from Woburn Abbey (1992) and Holkham Hall (2001). 728 pages with 548 illustrations in black and white and colour. New in Stock! Dolci trionfi e finissime piegature, Sculture in zucchero e tovaglioli per le nozze fiorentine di Maria de’ Medici. 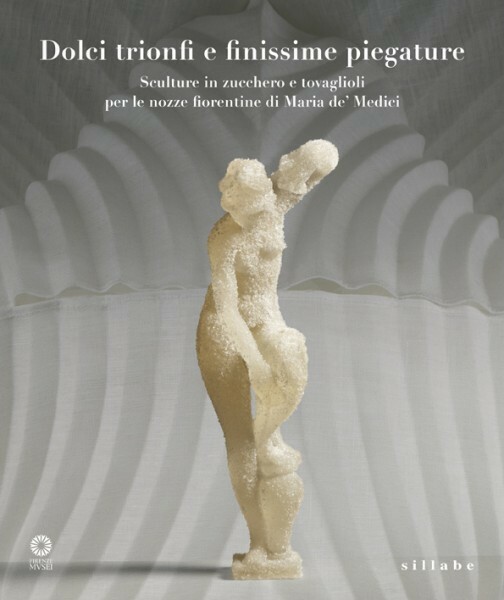 Catalogue at the Palazzo Pitti that examines sugar sculptures, the art of napkin folding and other table ornamentation for one of the most sumptuous wedding feasts in early modern Europe, the celebration of the proxy marriage between Maria de’ Medici and Henry IV of France. 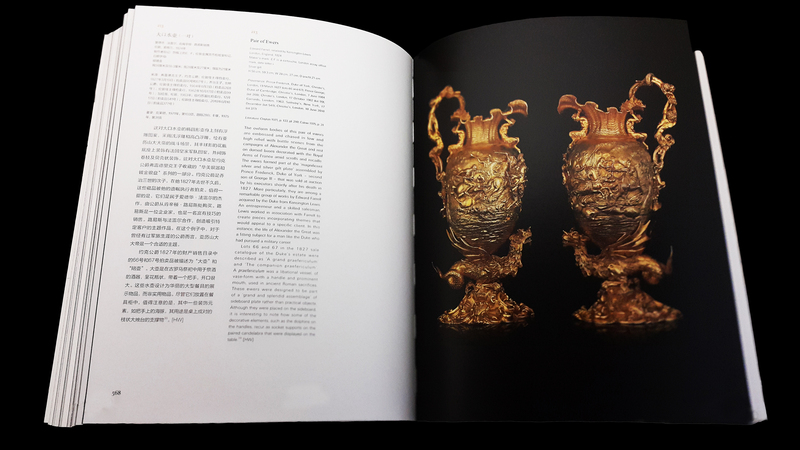 The catalogue entries include sugar sculptures designed by Giambologna (1529 – 1608): a glittering miniature Venus, the lion of Florence devouring a bull, and other designs in bronze that were recreated in sugar. 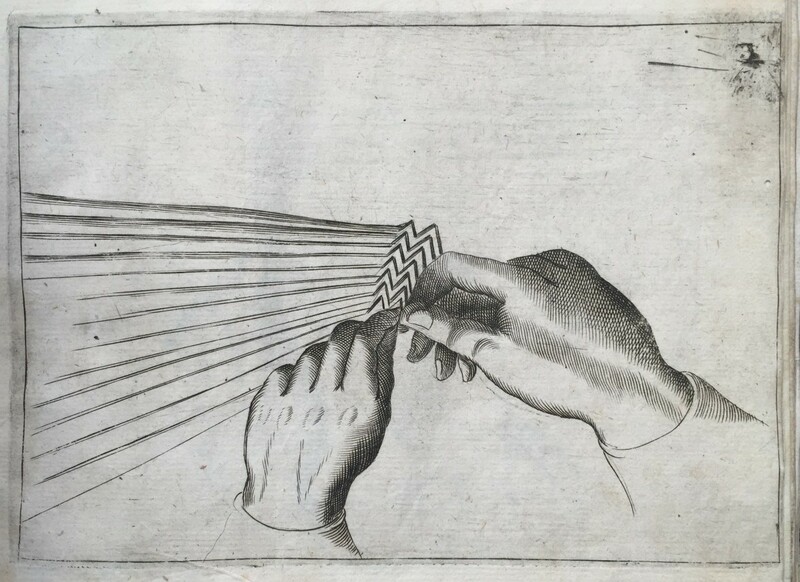 A whole chapter is dedicated to napkin folding, with modern reconstructions of 17th century designs, based on a 1629 edition of the Tre Trattati by Mattia Giegher. Also cited are instruction manuals for chefs; lavish dishes of silver gilt, lapis lazuli, ormolu and rock crystal; designs for a Medici-Bourbon coat of arms; medals and official paintings to commemorate the marriage; finishing with a painting by Bonaventura Gandi (1680 – 1731) of an attendant laying the final touches to a table covered in delicacies. The catalogue demonstrates just how much effort and expense went into such festivities, revealing both the artistry an extravagance of courtly resplendence. Also at Thomas Heneage Art Books we have the 2nd edition of the above cited Li Tre Trattati by Mattia Giegher from 1639, leather bound and in good condition. Mattia Giegher was a Bavarian master carver living in Padua, where sophisticated and theatrical dining was a central aspect of court life. This book was his most significant work, covering meat carving, table setting, serving, and napkin folding. 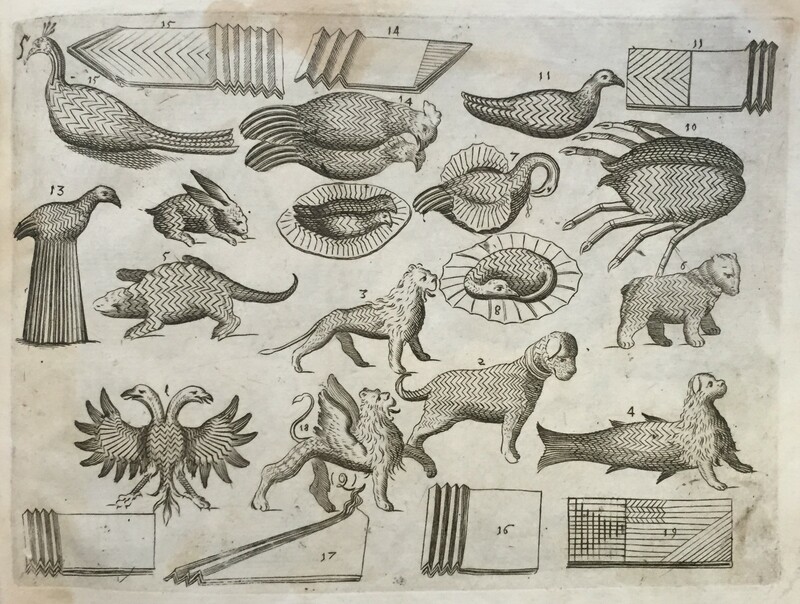 It is illustrated with 48 prints of elaborate napkin sculptures in the forms of animals, monsters, and galleons; diagrams showing the correct placement of dishes on a table; serving utensils; cuts of beef, pork, hare, fowl, fish, and lobster; and decoratively peeled and sliced fruits. 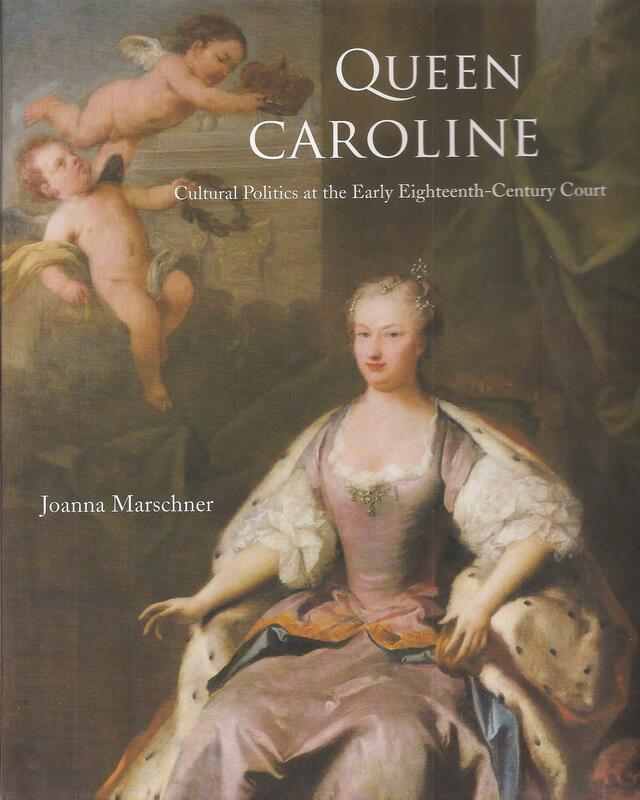 For those further interested in court festivities and lavish table decorating in early modern Europe, this is a crucial and informative edition. Giegher, Mattia. Li Tre Trattati. Padua: Paolo Frambotto, 1639. Oblong quarto (14.5 x 19.5 cm). 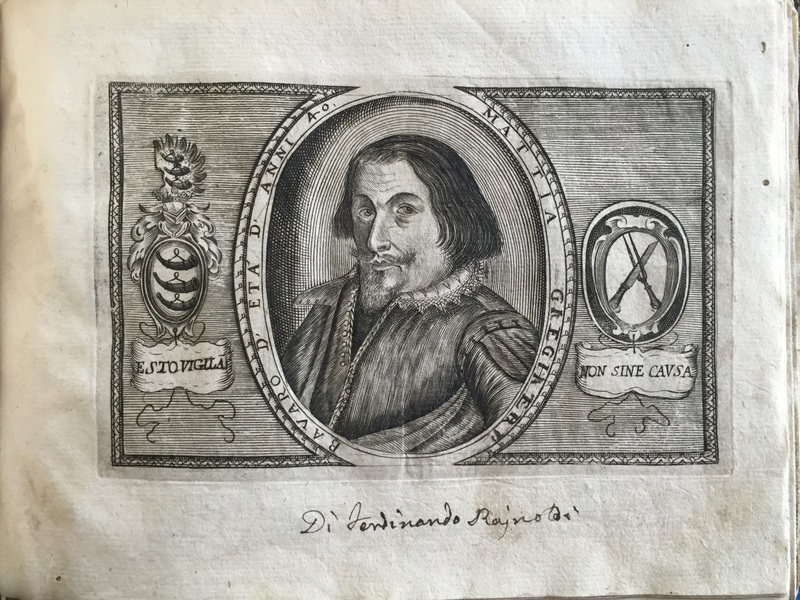 Portrait of the author and 48 engraved plates, engraved capitals and tail-pieces. Contemporary calf rebacked with the original spine laid down, spine gilt in compartments. For price, please enquire: +44 (0) 2079309223, artbooks@heneage.com, or come and visit us at 42 Duke Street, St James’s, London, SW1Y 6DJ. 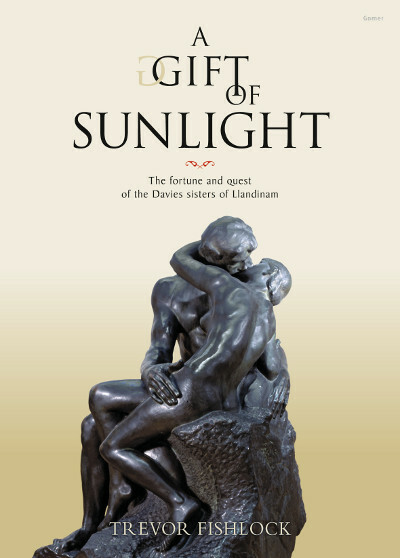 New in today: A Gift of Sunlight : The fortune and quest of the Davies sisters of Llandinam. By Trevor Fishlock. Llandysul: 2014. ix, 266 pages. Hard cover. 25 x 18.5cms. A new publication telling the story of the Davies sisters, Margaret and Gwendoline, who used their family’s fortune in coal to build what became the largest collection of Impressionist and Post-Impressionist art in Britain, which also included Old Masters such as Botticelli and El Greco, as well as contemporary British artists such as John Singer Sargent, Robert Bevan and Paul Nash. Endearingly told by Trevor Fishlock, and incuding photographs from the family archive, as well as a list of prices and dates of acquisitions, this book sets out the story of two pioneering women who believed that art was a power of good, and who bequethed almost the entirety of their collection to the National Museum of Wales, Cardiff. The former Russian imperial residence of Paul I and his wife, the Empress Maria Feodorovna, the collection of the Pavlovsk Palace Museum was formed following the royal couple’s Grand Tour of Europe in 1781-2. It ranges across a broad spectrum of luxury porcelain, antique and 18th-century sculpture, old master painting, decorative textiles, and architectural drawings, and is a document of the Russian Imperial taste for refinement and luxury, which rivaled the great European courts of its day. 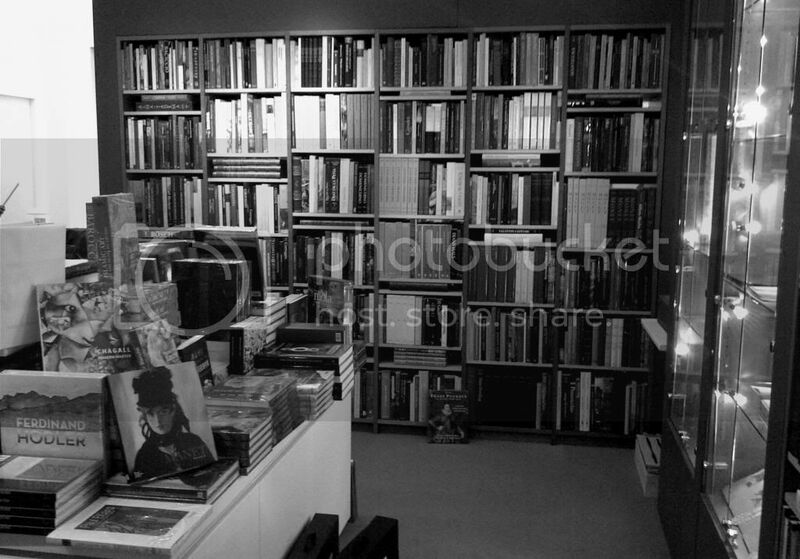 To order or inquire please email artbooks@heneage.com; or call the shop on +44 (0)20 7930 9223. We accept payment via Paypal. Vol. I.i S t. Petersburg: 2008. Series: The State Culture Preserve Pavlovsk. Full Catalogue of the Collections. 232 pages fully illustrated. Paperback. 21 x 27cms. An illustrated history of the palace’s construction, restoration and incarnation as a museum. Chapters are devoted to the Russian sculptors, architects and artists commissioned to produce works, as well as the many royals who lived there. Archival photographs testify to its recent history, including an account of the aerial bombardment and German occupation of the palace in World War II. Text in Russian. Vol I.ii St. Petersburg: 2011. Series: The State Culture Preserve Pavlovsk. Full Catalogue of the Collections. Paperback. 151 pages, fully illustrated. 21 x 27cms. Much of the design and sculptural programme of Pavlovsk Palace Park was inspired by Emperor Paul I’s visits to the palaces of Versailles and Chantilly on his Grand European Tour. The resulting collection includes Italian portrait busts and park sculpture from the 8th to 13th centuries, with important works by Paolo Triscorni, Pietro Baratta and Ivan Martos, in addition to 18th-century Russian mythological subjects in bronze and marble. 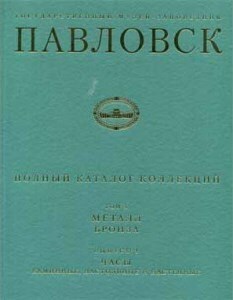 Text in Russian. Vol I. iii St. Petersburg: 2010. Series: The State Culture Preserve Pavlovsk. Full Catalogue of the Collections. 152 pages fully illustrated. Paperback 21 x 27cms. A room by room account of the interior decoration, furniture and objets d’art at Pavlovsk Palace. Many of the internal themes reflect the Tsar and Tsarina’s tastes for 18th century French classicism and Classical Roman style, alongside rooms in more traditional Russian style. The palace interiors underwent many reconstructions, according to the changing tastes of its owners, and were conceived at the hands of many of the greatest living European and Russian architects: Charles Cameron, Vincenzo Brenna, Giacomo Quarenghi, Andrei Voronykhin and Carlo Rossi. Text in Russian. Vol. III.i St. Petersburg: 2011. Series: The State Culture Preserve Pavlovsk. Full Catalogue of the Collections. 150 pages fully illustrated. Paperback. 21 x 27cms. The sculpture collection of Pavlovsk Palace is a testimony of Emperor Paul I’s fascination with antiquity. Among the works he purchased following his European grand tour are Roman marble copies of Greek and Hellenistic models, Roman originals in marble, small scale bronzes and funerary urns from Pompeii. Later works in the collection include smaller scale 18th-century bronze and marble figure groups, contemporary copies after the antique, and Russian 18th and 19th-century sculptures. Text in Russian. St. Petersburg: 2008. Series: The State Culture Preserve Pavlovsk. Full Catalogue of the Collections. 160 pages fully illustrated. Paperback. 21 x 27cms. The complete catalogue of 134 fans from Pavlovsk Palace, with a large number featuring Russian and European imperial themes. The collection boasts an astonishing array of styles and craftsmanship, including palmette, plié and brisé fans in painted parchment, lace, silk, ostrich feather, rhinestone, and mother of pearl. Includes mostly Russian and Western European examples from the mid 18th century to late 19th century, as well as a smaller collection of early 20th-century Chinese fans. Text in Russian. Vol. IV.ii. St. Petersburg: 2012. Series: The State Culture Preserve Pavlovsk. Full Catalogue of the Collections. 84 pages fully illustrated. Paperback. 21 x 27cms. 413 catalogued works of embroidery ranging across many techniques of production, from Russia, Western Europe and the Far East, and dating from the 18th to the early 20th century. Many of the items come from the original collection of Pavlovsk palace, and comprise decorative embroidered screens, inlaid furniture, embroidered carpets, table linens, cushions, decorative borders, embroidered pictures and miniatures. Text in Russian. Vol V.i. St. Petersburg: 2009. Series: The State Culture Preserve Pavlovsk. Full Catalogue of the Collections. 148 pages, fully illustrated. Paperback. 21 x 27cms. Catalogues the Dutch and Flemish paintings housed in the palace of Pavlovsk, the summer residence of the Russian emperor Paul I. The collection was formed by Paul during his tour of Europe in 1781 -82, and includes landscapes, still lifes, religious and genre scenes by masters such as Jan Frans van Bloemen, Pieter Claesz, and Adriaen van Ostade, among others. 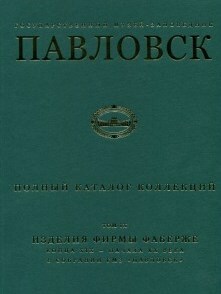 Text in Russian. Painting: Paintings of Italian and Spanish masters of the 16th – 19th centuries. Vol. V.ii. St. Petersburg: 2012. Series: The State Culture Preserve Pavlovsk. Full Catalogue of the Collections. 182 pages illustrated throughout. Paperback. 21 x 27cms. 182 pages fully illustrated. 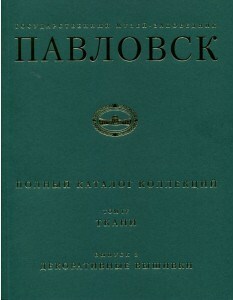 The second volume devoted to the collection of paintings at Pavlovsk palace, the summer residence of the Tsar Paul I. The collection was formed by the Tsar during his European Tour at the end of the eighteenth century and includes landscapes, portraits, and religious and mythological subjects by masters such as Guido Reni, Tintoretto, Andrea del Sarto, Francesco Guardi, and José de Ribera. Text in Russian. Vol. VI.i. St. Petersburg: 2010. Series: The State Culture Preserve Pavlovsk. Full Catalogue of the Collections. 216 pages, highly illustrated throughout. Paperback. 21 x 27cms. Documents the extensive library at Pavlovsk Palace, first established by Catherine the Great for the instruction of her son, the future Emperor Paul. Includes an impressive range of 18th-century works on the sciences, complete editions of contemporary writers, and Nuremburg publications on numismatics. The collection also boasts an important selection of 15th century illuminated manuscripts and incunabula. Text in Russian. Vol. VII.i. St. Petersburg: 2009. Series: The State Culture Preserve Pavlovsk. Full Catalogue of the Collections. 172 pages fully illustrated. Paperback. 21 x 27cms. Spanning more than two hundred years, the collection of ceramics at Pavlovsk embraces examples from nearly all the major producers of eighteenth and nineteenth-century porcelain, ceramics and faience, such as Wedgwood, Sèvres, Berlin, Vienna, Höchst, Ludwigsburg and Nymphenburg manufacturers. Text in Russian. Vol. IX. i. St. Petersburg: 2013. Series: The State Culture Preserve Pavlovsk. Full Catalogue of the Collections. 328 pages fully illustrated. Paperback. The collection of Fabergé items at Pavlovsk make up a small but highly important section of the larger collection of over 1,250 objects d’art collected by the Emperors Alexander I and II and the imperial princes. Among the luxury objects are leather and silver bound books, decorative caskets, glass and silver tableware, late 19th c. handcrafted thermometers, decorative frames, and jewel studded Russian figurines. The volume includes an index of manufacturers’ monograms and biographies, a subject index of the entire collection and lists of purchases. Text in Russian. Vol. X.i. St. Petersburg: 2011. Series: The State Culture Preserve Pavlovsk. Full Catalogue of the Collections. 175 pages fully illustrated. Paperback. 21 x 27cms. From the state museum collection of Pavlovsk, the former summer residence of the Tsar Paul I during the late 18th century. The current volume is the complete catalogue of the museum’s collection of Russian and European clocks, from mostly Paris, London and Vienna, and dating from the mid 18th century to the turn of the twentieth century. Text in Russian. 176 pages, 129 colour illustrations. Vol. XIII. St. Petersburg: 2013. Series: The State Culture Preserve Pavlovsk. Full Catalogue of the Collections. 196 pages, fully illustrated. Paperback. 27 x 21cms. 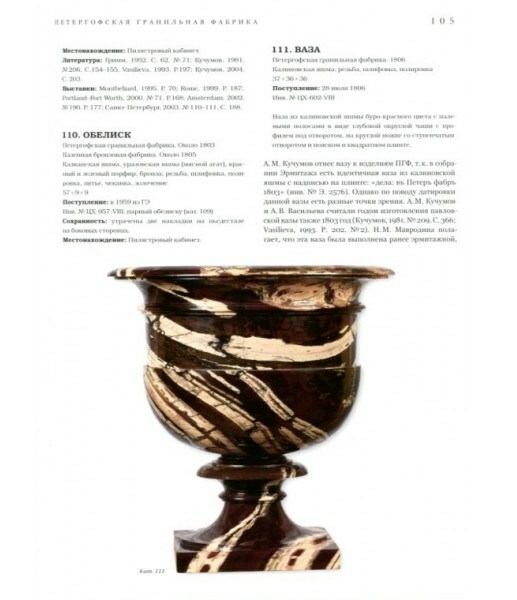 Celebrates the array of Russian coloured stoneware at Pavlovsk, including works in jasper, porphyry, malachite, lapis lazuli, and quartz, used in the production of mantelpieces, fireplaces and particularly decorative vases at the palace. Handles, garlands and other ornaments were often added in bronze or ormolu to the designs of eminent architects. Text in Russian. 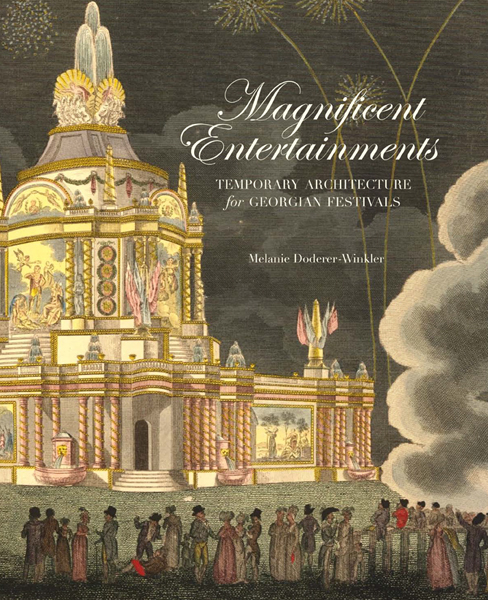 Drawing: The architectural drawings of the late 18th and early 19th centuries. Vol. 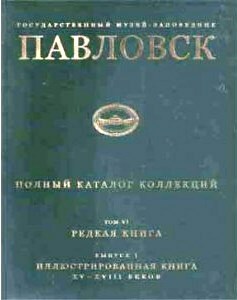 XV.i. St. Petersburg: 2011. Series: The State Culture Preserve Pavlovsk. Full Catalogue of the Collections. 220 pages fully illustrated. Paperback. 21 x 27cms. Publishes the palace’s collection of architectural drawings of great 18th-century Russian palace architects including Vincenzo Brenna, Giacomo Quarenghi, Henri-François Viollier, Andrei Voronykhin and Charles Cameron, original architect and designer of Pavlovsk Palace and gardens. Text in Russian. by Christopher Wright: 2 volumes. London: 2014. Hardcover in slipcase. 35 x 25.7cms. Catalogue of a British private collection of more than 400 works by artists such as Rubens, Tintoretto, El Greco, Turner, Ingres, Delacroix, Cranach, Pissarro and Sisley, formed over the last 35 years. Volume I features a small reproduction of each painting, along with comparative works, a biography of the artist, and full provenance, while Volume II includes larger colour illustrations for all 420 works, organised by school. 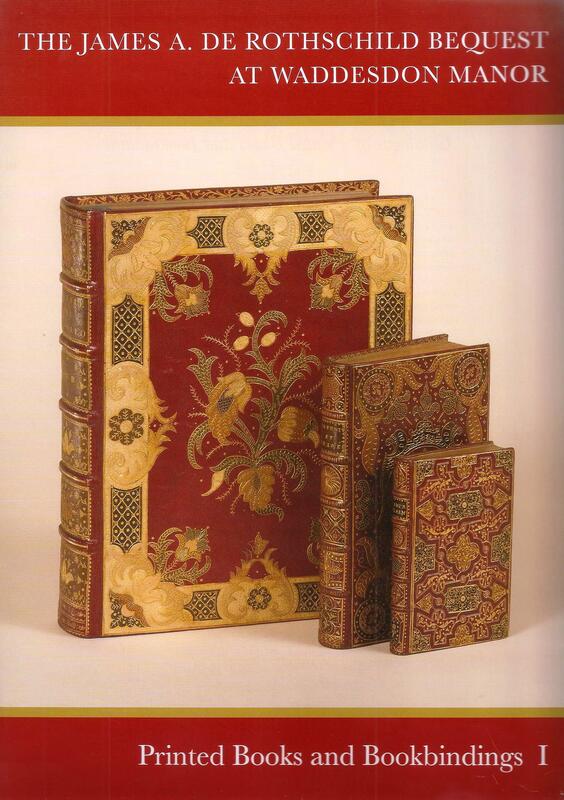 Barber, Giles: The James A. de Rothschild Collection at Waddesdon Manor: Catalogue of Printed Books and Bookbindings. 2 vols. 2013. Together 1162 pages and 60 pages index, with 96 colour plates and 880 monochrome illustrations. Over 1000 images of bookbinders’ tools, in actual size. Cloth, 30.2 x 22.2cms. Catalogues Baron Ferdinand de Rothschild’s book collection, compiled in the last twenty years of the 19th century. Seven substantial chapters on Parisian bookbinding discuss the trade, techniques and legacy of bookbinding in the 17th and 18th century, both French and English. Includes an index of tools, a provenance index of previous owners with brief biographical notes, booksellers’ traces, bibliography and index. Schmidt, D., and Maria Sframeli: Diafane Passioni. Avori Barocchi dalle Corti Europee. Exhibition: Florence, Palazzo Pitti, 2013. 352pp., illustrated throughout in colour. Paperback. 28 x 24cms. Accompanies the first exhibition devoted to baroque ivory sculptures, focusing upon Ferdinando I de’ Medici’s (1549-1609) superlative collection, supplemented by international loans from the Louvre and elsewhere. 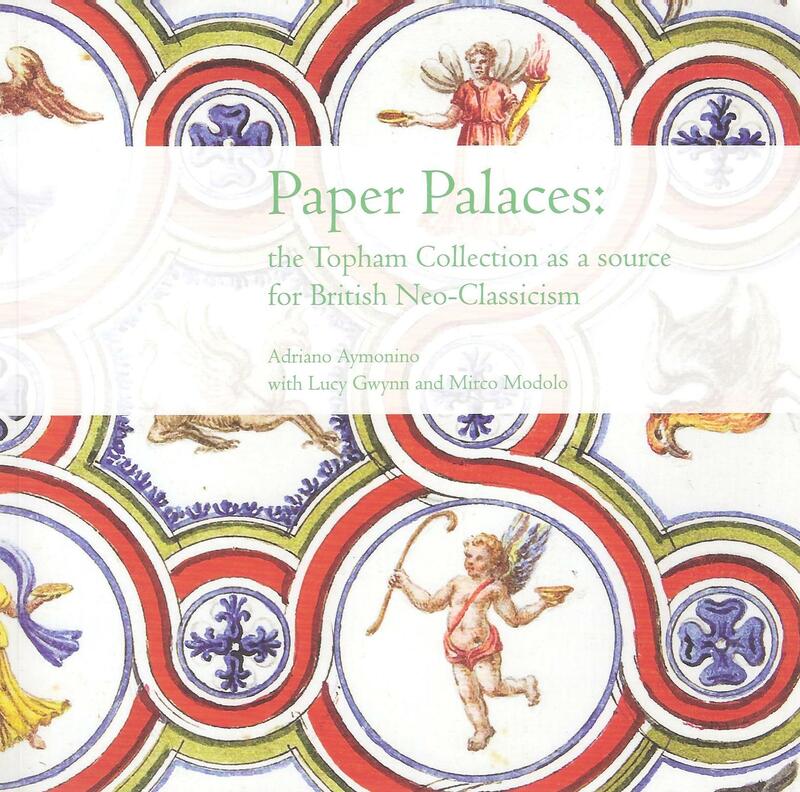 Aymonino, Adriano, et al: Paper Palaces: the Topham Collection as a source for British Neo-Classicism. Exhibition: Windsor, Eton College, 2013. 56 pages, with numerous colour illustrations throughout. Paperback. Introduces Richard Topham’s (1671-1730) collection of drawings, watercolours and prints after antique sculpture and painting in Rome, held in Eton college since 1736. The largest of its kind amassed in England, it enormously influenced architects such as Richard Adam, James Wyatt, and Charles Cameron.